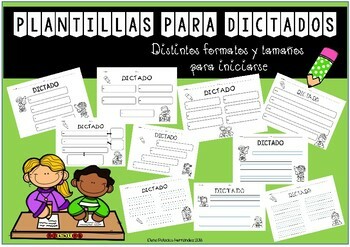 Este material contiene 23 páginas con distintos modelos, formatos y tamaños de plantillas para la iniciación en el dictado (escritura de palabras) de niños y niñas de 4 a 6 años, según sea la necesidad del alumno y el momento en que se encuentre de su aprendizaje en la escritura. Todas ellas tienen para poner el nombre del alumno y la fecha en la que se realiza la actividad, de esta forma llevar un control. 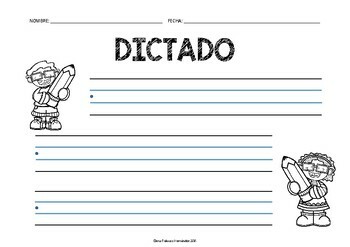 Sólo es necesario imprimir y usar. 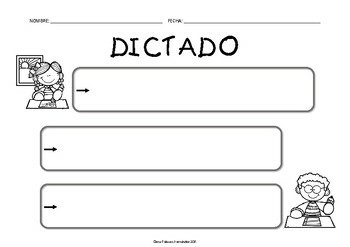 This material contains 23 pages with different models, formats and sizes of templates for the initiation in the dictation (writing of words) of boys and girls from 4 to 6 years old, according to the needs of the student and the moment in which he finds himself. learning in writing. 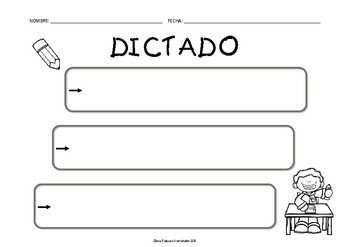 All of them have to put the name of the student and the date in which the activity is carried out, in this way to keep a control. It is only necessary to print and use.